Moto G ( 3rd Gen ), white variant leaked, with 8 GB of Internal storage it has been spotted in Flipkart ( India’s largest e-commerce site). This is not the first time we’re seeing a Flipkart page for Motorola devices even before it’s release. Earlier we’ve seen Moto x 2nd Gen and Moto 360 smartwatch page leak on Flipkart and showed the specifications, images of it. 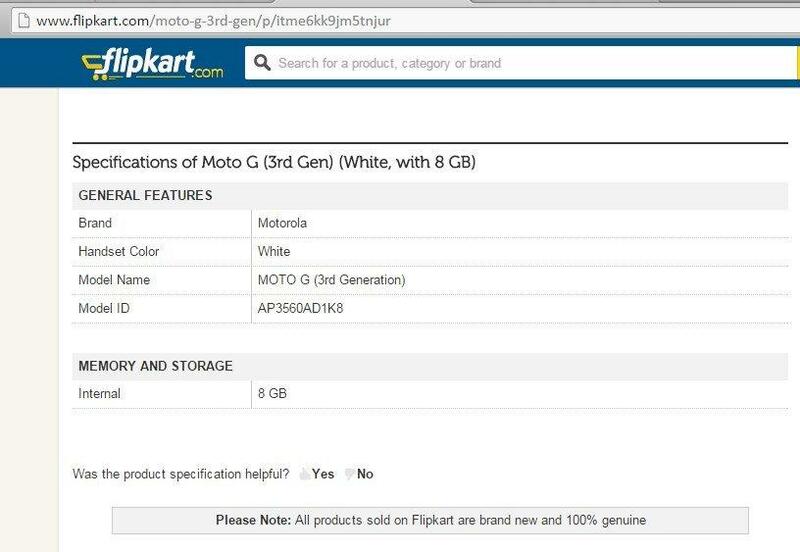 Now we’re seeing a Flipkart page which shows only few details about Moto G 3rd Gen smartphone but there isn’t full list of specifications nor images. The developers and the Content writers might be testing the page, and might have accidentally made it online although the details are yet to be finished. These mistakes happens rarely but from Flipkart-Motorola duo we’ve seen so many like this. Leaks like these grab the attention of users and increases their expectations on the smartphone. 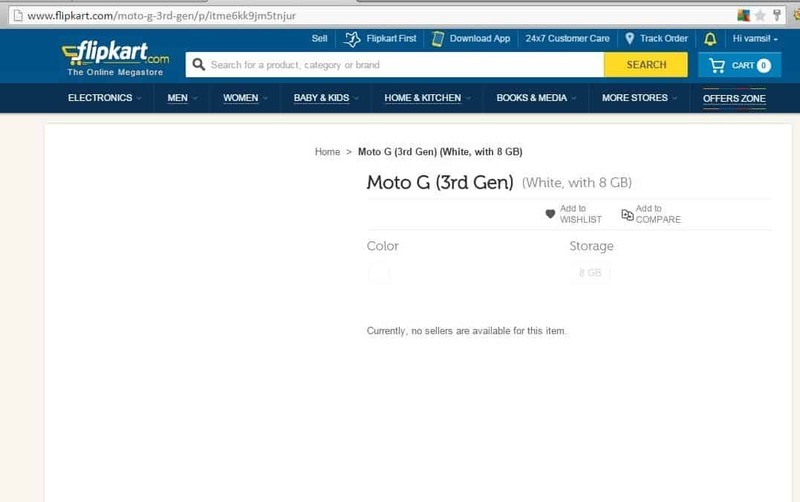 Even this leak belongs to the same category, The page in Flipkart only shows the “Moto G 3rd Gen ( white, 8 GB) and there’s no price detail. Below in the specifications tab, it is mentioned that the model number for this will be AP3560AD1K8 and no other details are added. The link is still live to check, but it may go down soon. Coming to the launch date, we can’t really tell the exact release date as Moto E 2nd Gen is recently entered into the market, so we’re expecting the launch date will be somewhere around in Q2 2015. Remember the Moto G 1st Gen and Moto X 1st Gen launch ? They’re launched after Moto E 1st Gen , as usual Motorola (Lenovo Company) might planning similar to that. Besides to this information there’s no leak regarding specs and prices, we might be updating this post if we find any new information on this. So, what you think about this new Moto G 3rd Gen ? Any expected specs that you would like to share ? please drop them in comments. Meanwhile you can check out some cool deals on Flipkart, new deals everyday.